Murphy showing the RGM Watch Co. Caliber 20 Model to NAWCC Ad Services Coordinator, Corinne Dedrick, and Publications Intern, Jessica Giaquinto. Photo by Keith Lehman. All it takes is one visit to RGM Watch Co. to see how truly unique the company is. Nestled in Mount Joy, PA, RGM melds the old-fashioned craftsmanship of watch-making with modern technologies and creative styles. Founded by Roland G. Murphy in 1992, RGM builds, repairs, and restores watches. The watch shop is the only one in the United States that still makes mechanical movements in-house. It builds about 50 to 60 watch movements a year, and all watches are mechanical and high-end. 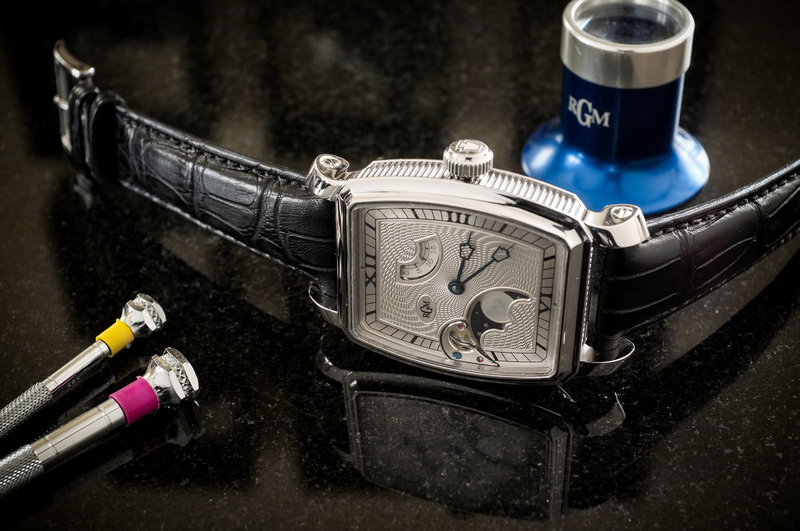 A variety of complications, styles, and tools make RGM watches pieces of time-telling artwork. 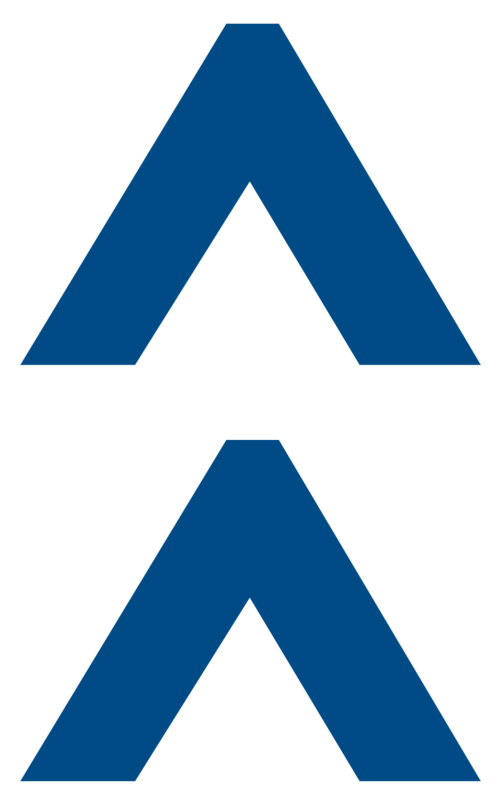 Although Murphy makes unique movements and cases, he and his team also build cases around Swiss movements purchased from several companies in Switzerland. Murphy also searches the Internet for antique watches and movements to repair or restore. Some of the detail that goes into these watches, as well as his American-made watches, include guilloché work. He engraves many styles and patterns of guilloché on metal and mother of pearl. RGM owns a rose engine for such work. 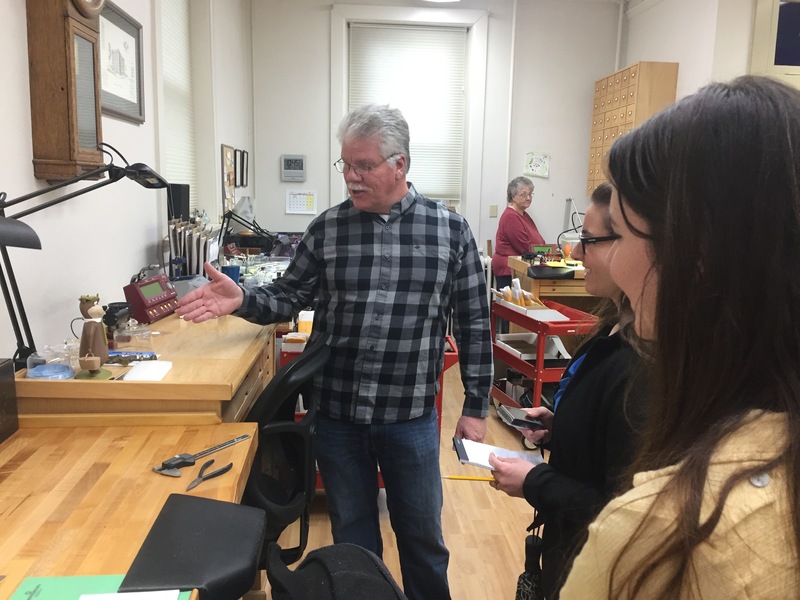 Down in the basement, there are also machines for glass beading and polishing, and in a closet lays a machine for physical and ultrasonic cleaning. When exacting the design of a watch, RGM takes advantage of a 3D printer and computer-aided drawing (CAD) technology. RGM uses these machines, programs, and other equipment for watch-making techniques that span the 16th to 21st centuries. RGM Watch Co's. Caliber 20 Model. 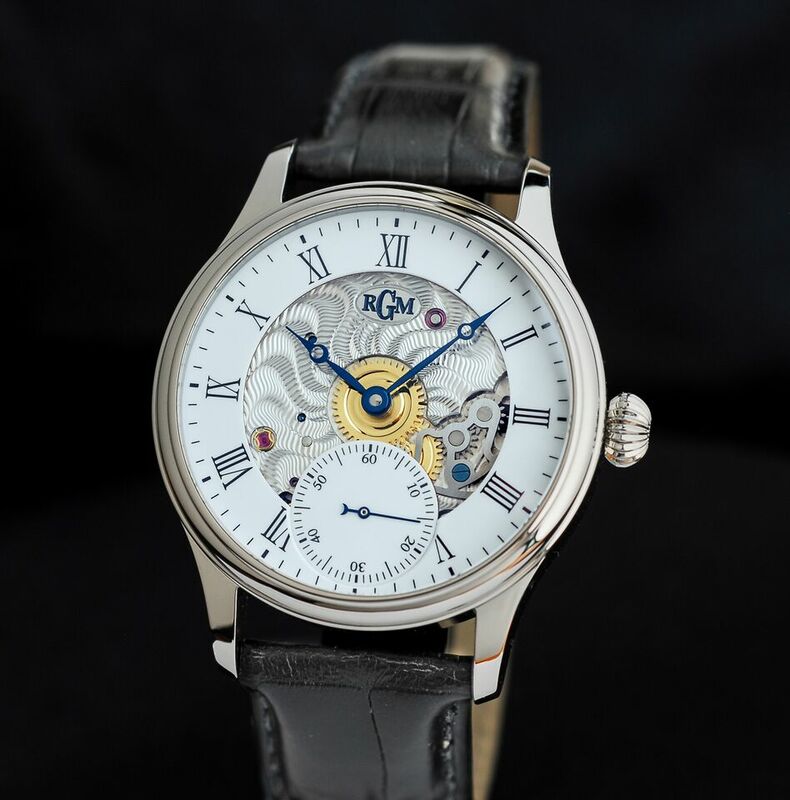 Photo by RGM Watch Co.
Model 801-EE with enamel skeleton dial and hand cut Engine-Turned (Guilloché) Main-plate. 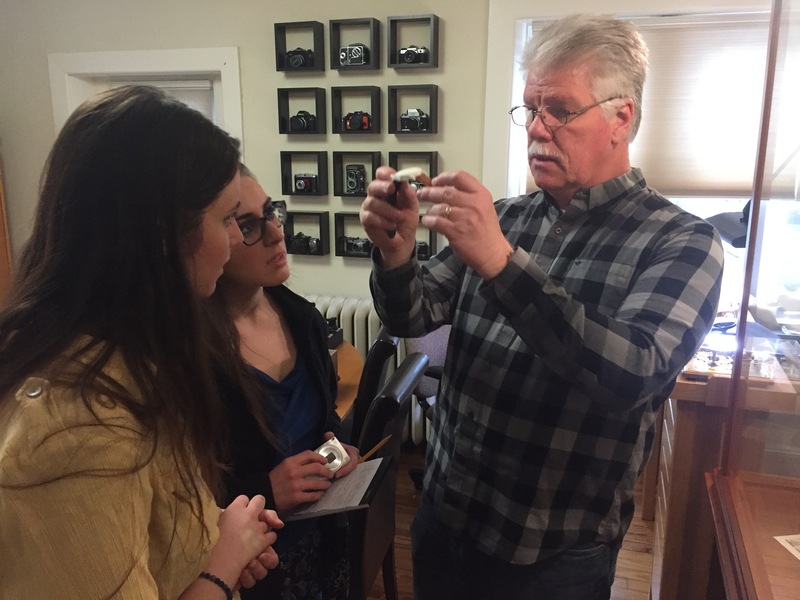 Photo by RGM Watch Co.
Murphy explains how a 3D printer is used to make watch case prototypes. Photo by Keith Lehman. 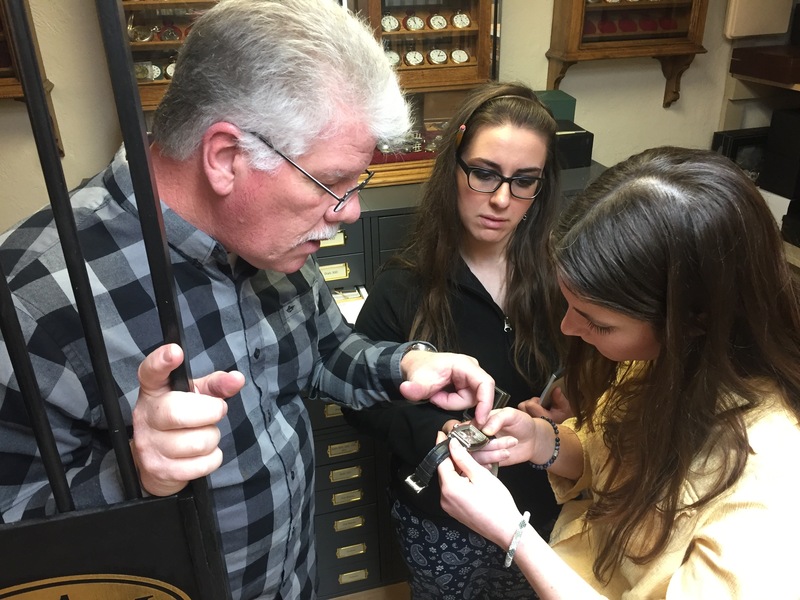 Murphy’s favorite pocket watches and wristwatches reside in what once was a bank’s walk-in safe, and other historical structures of the bank remain throughout the building. Murphy stores the masterpiece watches in black boxes. RGM makes something to fit any taste, from pocket watches to modern artistic wristwatches. For the antique wristwatch lover, RGM carries a line of railroad watches. The railroad watches’ styles vary by the type of dial, which includes boxcar dials, Canadian dials, and Ferguson dials. RGM’s art watches display more colorful and modern designs. These wristwatches include many enamel dials, decorated in the cloisonné style. Two of the featured watches had regattas depicted, one in cloisonné and the other in a wood mosaic. Another classic artistic design is the chess watch, which has the game pieces fired onto the face in place of the hour numbers. Murphy takes pride in his antique collection and original designs. Murphy shows how his 3D printer is used for other, non-horological purposes, at RGM Watch Co. Photo by Keith Lehman. 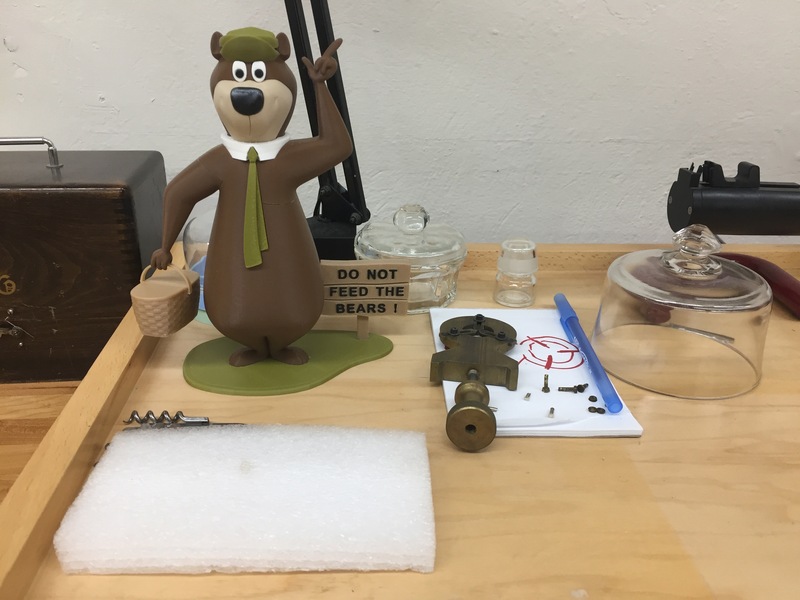 3D-printed Yogi Bear at RGM Watch Co., Mt. Joy, PA.